One little “back story” illustrates—for the uninitiated—the trail a diligent family historian must sometimes follow to reach the authentic source for one fact. Citing a source gives the reader of the family history an idea of how grounded that fact is, how much weight it carries as evidence. It tells the reader what the source is, who created it, and where it is. 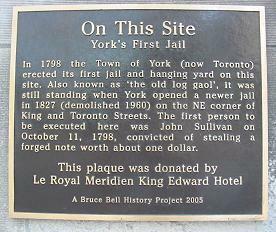 George Porter the prisoner was released from the York Jail in July 1814 on a writ of habeus corpus. Charles Black, "Register of Persons Connected with High Treason, During the War of 1812 With the U.S.A" (monograph, 1926); Archives of Ontario, MU 1368. Some researchers might stop here as having cited an “authority,” but was it really? What Black did was compile a list of people. A compilation is derived from material in a prior existing source. There was no footnote or citation to where he obtained the information. However, in his text, Black made reference to “AO Term Book, steel case 7” which seemed to apply to the fact I wanted. Charles Black, "Register of Persons Connected with High Treason, During the War of 1812 With the U.S.A" (monograph, 1926), Archives of Ontario, MU 1368; citing AO Term Book, steel case 7. That sounds more authoritative to the reader, n’est-ce pas? But does it tell the reader what the source actually is? What was it Charles Black actually viewed to give him that information? One asks oneself, what is an AO Term Book? What is a “steel case 7”? Most readers would be nonplused to judge the merit of such a source. Or where it is located. How to proceed from there? Well, I suspected the AO referred to Archives of Ontario (although the designation is also used for [British] Audit Office archival material). Then it seemed logical that only a judge could have issued such a writ. I knew from experience with provincial records that the Court of King’s Bench handled treason cases. Into the finding aid I went for Archives of Ontario’s court records. Yes, term books exist for the right period. Then a trip to see the source on site. No steel cases, though. The original books are now housed in acid free boxes, and I found what I wanted in box 7. Upper Canada, Court of King’s Bench, Rough Term Books, 1794-1855, Book 7 (1812-1816), 14 July 1814: Decor, Fowler, and Porter; Archives of Ontario (AO), RG 22-127-0-7. The rough term books are transcripts of court clerks’ records of decisions from the judicial bench. They are the closest contemporary records we have for trial results, since detailed trial proceedings—as we know them today—rarely exist in the nineteenth century. Hopefully that citation will tell the reader that a court record is a sound source to support my fact, and provides the necessary information for retrieval of the same. Tracking ancestors is not all a family historian sometimes has to do. Tracking the provenance of a piece of information sometimes becomes necessary and is good research practice. Thanks for the clue, Mr. Black, but not for the prolonged hunt! Financial district, Toronto, March 2010, photograph BDM. Turn-of-the-nineteenth-century George Porter in Upper Canada: One man, or two? Or three? Almost every researcher who pursues ancestry beyond their grandparents will find an example of this classic genealogical problem—“same name” occurrences in one general vicinity and time frame. The attempt to identify same-name individuals in any documented circumstances can lead into unexpected research routes and complicated associations. Previous posts outlined some of the known life of George Porter whom I will call The Carpenter: building one of the first dwellings in the town of York, and comparing his signatures with a later George Porter. Alert readers generally concurred that the signature comparison seems to indicate two men, even if only by the formation of the capital G initial. And yet ... one G (in 1796) seems to “match” the 1814 signature. It’s on a petition stating George (The Carpenter) has a 26x18 dwelling frame ready for a York town lot. Not enough to assert that the later man might have been “our” George The Carpenter, returning like a ghost from an absence of fifteen years. If they are indeed two different men, their origins and ultimate fates are still a blank. Birth, parents, spouse, and death are the missing primary information in all but one instance. Most of the information in prior posts is not repeated here, but George Porter was evident in Newark and York between 1792 and 1799. Self-described as a carpenter and a former sergeant of militia, he was busy claiming town lots in both communities while inhabiting a farm on the outskirts of York on the Don River. In 1795 a man of this name received a preliminary location ticket for lot 5 concession 3 in York Township. George Porter was in the York jail in February 1814, accused of stealing Indian property in the aftermath of General Procter’s 1813 retreat from the western settlements (again: here). The events for which he was arrested apparently took place in the Lake Erie area, London District. Several clues in his petition asking to be released were interesting. One, he said he’d been in the province for 20 years, which takes him back to 1794. Two, he said he’d been recommended as a civilian employee to Colonel Gordon of the 26th Regiment. Gordon was the commander of the “upper” frontier posts for an undetermined time in the early 1790s. Newark was a hub for the military presence. Carnochan reports Gordon’s attendance, along with Governor Simcoe, at an important Indian meeting in 1792 in Newark. Gordon returned to Newark for the duration of the War of 1812. He had transferred to the Royal Scots regiment, on duty at Fort George. So George The Prisoner could have met with Col. Gordon before/during the War, ... or in the early 1790s. Three, George said he’d been granted lot 5 concession 1 in York Township, a strikingly similar description to what was supposedly one of The Carpenter’s claims in 1795. Was the slight change in concession number maybe a memory lapse after some twenty years? Whatever, lot 5 in the 1st concession east of Yonge Street “with broken front East of the River Don” was firmly in the hands of a William Cooper from 1794 to 1799. Four, George’s petition—a number of lines on the right hand side drifting into illegibility—referred to “one dagard[,] a person who had left his family at P[resk] Isle and came there and Lived with a squaw ...”. Essentially, he blamed “Dagard’s” woman for his current incarceration. You can spot many puzzling and frustrating items in the stories thus far. It would seem doubtful to us that a man would desert his family in York only to have the nerve to start another life off in the London District. Word would get around! And yet while they seem like two different men, there are potential (real?) intersections in their lives. Disclaimer: This is an exercise to keep the brain fog at bay; I have no vested interest in the characters. Maybe a proper article will eventually form itself from this intermittent series of musings. Reasonably exhaustive research sometimes looks endless. In order keep this post a reasonable length, more posts will be upcoming as the circle widens around the targets. NEXT: Persons of Interest: The Rifleman! The Surveyor! The Blacksmith! The Doctor! ... all Porters, all in the same places. Nassau District Land Board minutes (1792), Vol 5, p. 180; LAC microfilm C-14027. Upper Canada land petitions P Misc/16, Vol 390; P2/43, Vol 400; P2/30, Vol 400; P4/18, Vol 400a; P4/17, Vol. 400a; P Misc/29, Vol. 399; LAC microfilms C-2484, C-2489, C-2488. Christine Mosser, ed., York, Upper Canada, Minutes of Town Meetings and List of Inhabitants, 1797-1823 (Toronto: Metropolitan Toronto Library Board, 1984), 5 & 13. Archives of Ontario, Ontario Land Records Index. York Township Papers for concessions 1 and 3 do not contain any reference to a George Porter. St Marks Anglican (Niagara-on-the-Lake) registers, Fairchild-Muir marriage (1806); AO, MS 545 reel 1. (Margaret Vanalstine was previously married to John Muir). Benjamin Fairchild, death notice, Christian Guardian, 11 April 1838, p. 91. Correspondence of the Civil Secretary (Upper Canada Sundries), RG 5, A 1, pp. 7871-7872; LAC microfilm C-4543. accessed 28 April 2010). The 26th was stationed in Canada and Nova Scotia from 1787 to 1800. The Royal Scots served throughout the War of 1812. Janet Carnochan, History of Niagara (1914; reprint Belleville, Ontario: Mika Publishing, 1973), 191-192; citing “Michigan Historical Society publications.” Gordon is not mentioned in Indian meetings at Newark in 1793 or 1795. Cooper’s survey and warrant, York Township Papers, pp. 36-39, AO, MS 658 reel 533. Alexander Fraser, ed., “Minutes of the Court of General Quarter Sessions of the Peace for the London District, 1800-1809, 1813-1818,” Twenty-Second Report of the Department of Public Records and Archives of Ontario (Toronto: Legislative Assembly of Ontario, 1934), 120. Court of King’s Bench, Rough Term Books (1812-1816), AO, RG 22-127-0-7. Actual trial proceedings have not survived from this era. Now available: the 2nd edition of CAMELOGUE!